If you were suddenly granted the power to be young forever, what would you do with your extended time on Earth? Most people would probably take advantage of this phenomena, forming for themselves an everlasting career in acting or modelling (take your pick) where their youthful looks would lend many opportunities for eternal work. Others would build up a large trust fund over the years, putting certain amounts of money away every year and eventually working their way up to a hefty total in a couple hundred years’ time. Or, in the worst case scenario, they’d develop a taste for human blood and live out their days as brooding vampires as written by an out-of-her-depth Mormon writer. For Adaline Bowman, the main character who has this power enforced onto her in The Age of Adaline, it’s an excuse to wear pretty dresses and lay low from the authorities. Though it’s perhaps not the best use of such a power, it’s still enough to conjure up a decent if imperfect romantic fantasy. Bowman, a woman born on New Year’s Day in 1908, is involved in a car accident at the age of 29 which, combined with a bolt of lightning shortly afterwards, leaves her immune to aging thanks to a phenomena which, according to the film’s clunky and exposition-heavy narration, won’t be discovered until the year 2035. Once you’ve gotten over the fact that twenty years from now humanity will have cracked the pesky code of immortality, you’ll see that she lives a sheltered and immensely private life where she refuses to have her picture taken and occasionally meets with her daughter, now an elderly woman played by Ellen Burstyn. Of course, when you say it out loud it all sounds rather ridiculous, but it would ordinarily get a pass since this is definitely trying to be a fantasy, somewhere along the lines of The Curious Case of Benjamin Button and other films like it. However, unlike David Fincher’s Oscar-winning flight of fancy, there’s a bit too much of an attempt to understand this “magic” rather than just accepting it as a fantasy that doesn’t necessarily needs to be explained. We don’t need to know why Benjamin Button is born an old man and gets younger as he grows older, so we don’t need some hokey narration telling us the exact scientific details of why this woman can now suddenly never age; just let a fantasy be a fantasy. The script, as well as director Lee Toland Krieger (Celeste and Jesse Forever), is much more interested in how Adaline lives her life with this power as a curse rather than a blessing. As the years go by, we see how old friends and even her own daughter continuously show their age – in one early scene, she and her daughter are almost mistaken for sisters – while authority figures like the FBI start to show interest in a plot device that leaves as quickly as it’s introduced. Mainly, we see how her love life is affected, in particular with the handsome Ellis (Game of Thrones’ Michiel Huisman) who’s a decent enough guy for Adaline to develop some kind of a connection over, even if it is much like any other romance movie ever (though not necessarily the sappy Nicholas Sparks kind, either). Then there’s Harrison Ford as Ellis’ father who as it turns out has a connection of his own to the ageless beauty. Thankfully, it doesn’t turn into some kind of demented and just plain weird love triangle, but it does create a decent amount of conflict as Adaline ponders her choices both past and present and how they can never seem to cease following her everywhere she goes. Blake Lively is a fine and watchable lead, while Ford is equally as strong in one of his more memorable performances in a long time – everyone else has their moments in and between, but it’s really these two actors who stand out the most. 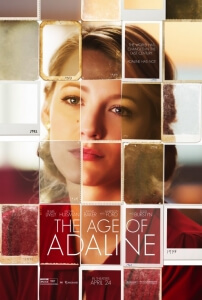 It’s definitely imperfect, for instance there are a few too many sappy moments that are only there to please romance enthusiasts and, as we said, the narration that feels the need to provide an unneeded scientific justification feels like it was added on late in the game by producers, but The Age of Adaline is fine, serviceable entertainment that, while not immortal, is pleasantly aged. The Age of Adaline is an imperfect but highly watchable fantasy romance that boasts fine performances from Blake Lively and Harrison Ford as well as some interesting conflicts based around the gift of immortality, but a tacked-on scientific understanding behind the so-called magic as well as some sappy moments here and there threaten to ruin the fantasy for those just wanting to be charmed by it all.